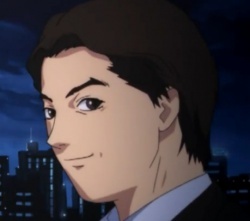 Takuyoshi Masuoka is a member of the Knights of the Eastern Calculus. He is an elite businessman and the first to be killed by the Men in black in Layer 10 when the Knights' identities are revealed. According to Visual Experiments Lain, his Wired handle is CAT. 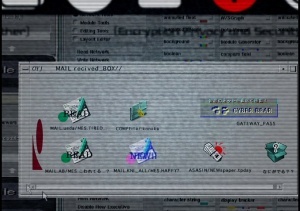 Also in Layer 07, he checks his email and his computer screen is shown. The OS interface was designed by Nakahara Junji, and the rotating CGI Knights symbol was made by Ueda Yasuyuki. The icons are interestingly named. On the far right the icon named GATEWAY_PASS is a reference to the Serial Experiments Lain PSX game. Other icons are apparently emails from Ueda (he's tired) and Abe (a reference to Weather Break). This page was last edited on 24 February 2017, at 19:43.